DDM’s Sheniah Armstrong accepts a donation of emergency communications equipment from Andrea Grosvernor of CDEMA. 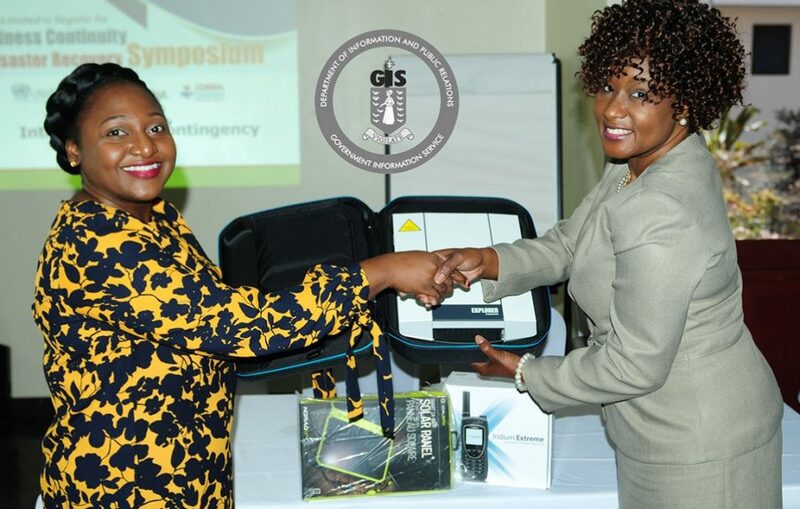 The Department of Disaster Management (DDM) has received communications equipment to aid in strengthening the emergency telecommunications system in the territory. A government media release said the donation consists of an extreme satellite phone, a satellite internet terminal, and two solar panels. The Caribbean Disaster Emergency Management Agency (CDEMA) donated the items this month. CDEMA presented the items during a Business Continuity and Disaster Symposium on May 15 at the Moorings Mariner Inn. The media release said the main aim of the symposium was to officially launch the local ARISE Chapter which seeks to raise awareness and increase understanding of opportunities for the public and private sectors to collaborate. The symposium also focused on disaster risk reduction and how businesses can become more resilient by following its practices. Several local companies including Maria’s by the Sea, K-Mark’s Foods, Tortola Concrete Limited, the H Lavity Stoutt Community College, S&D Security Systems, and the Caribbean Broadcasting Network were in attendance. While speaking at the event, Chairman of the BVI Chamber of Commerce and Hotel Association Louis Potter outlined the history of hazard impacts in the BVI. The DDM said it hoped participants left the workshop with a ‘better understanding of mitigating the risk of disasters and understand the importance of having a business continuity and recovery plan’. The critical components of such a plan include the introduction, outlining the scope, purpose and objectives, critical assumptions, administrative policies, and documenting actions to be taken in the mitigation, preparedness, response and recovery phases of a disaster. Among notable benefits of the programme were opportunities for the private sector to sit and develop their own ideas and how they can assist communities and themselves in building disaster risk reduction activities and implementing them, the DDM said. The Symposium was jointly organised by DDM in collaboration with BVICCHA, the United Nations Office for Disaster Risk Reduction, and CDEMA. In the meantime, CDEMA’s donation of communications equipment to the DDM came on the heels of the Health Ministry receiving a communication kit to help re-establish the sector’s emergency telecommunications network from the Pan American Health Organization. Great gesture lets see how we can improve service. ONE PHONE is a Great start. But maybe we can find some money for some more phones? and two solar panels. We will donate few more solar panels if someone chips in for more phones.